If there is one thing I have in common with the BF, that is our mutual love for Ryan Reynolds, the actor. Of course, I drool over Ryan and the bf likes his comic style. So whenever there is a Ryan Reynolds movie, we don't need to ask each other: the answer is yes, we will watch it on the soonest possible weekend. 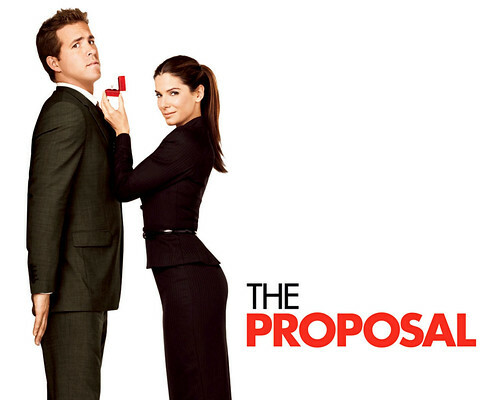 When we watched Transformers 2, we saw the trailer for the Proposal and I could say that I wasn't hooked on it as much as I was with Definitely, Maybe [starring Reynolds and another actress I love, Isla Fisher.] I was not really that much of a fan of Sandra Bullock, Reynolds' co-star in this movie. But we watched it anyway. haklsjfjlahdksjsjsjs. I lose all sense of comprehension. First of all, Ryan Reynolds did not disappoint. He was his usual I-am-clueless-about-how-I-look-no-I-am-not-hunkingly-painfully-gorgeous self. If I counted the times I had dreamy eyes while watching, I never would have finished the movie. Second of all, it was a romantic comedy, only my favorite genre in the whole world --- and only because these kind of movies save me from boredom, occasional depression and what have you. Third --- it was crazy. The plot is crazy. Who would fall in love in three days? Why would Andrew [Ryan] fight for Margaret [Sandra] when she was the boss from hell? I have no idea either. But the movie itself served its purposes, that are: a) entertain me with all the antics [the dog, the eagle, Ryan PG rating naked scene, Margaret's Louboutins and Ryan PG-rating naked scene]. b) the movie made me squirm in my seat in pure kilig. c) There were countless LOL moments that I got a little scared the one to my left at the cinema was gonna whack me in the head for laughing too much. But then again, she was probably laughing that hard, too. d) enjoy a good movie without worrying if the BF was not liking the movie coz judging from our synced guffaws, I know that he was e) made me wish I was ScarJo for a moment. How many superficial stars do I give this movie? 3. It wasn't THAT superficial. In fact, it was a mix of hopeless romanticism and realistic issues which makes it all the more watch-worthy! I gotta admit it made me feel a little nostalgic when Margaret admitted she hated not having a family beside her. But then again that is another story.